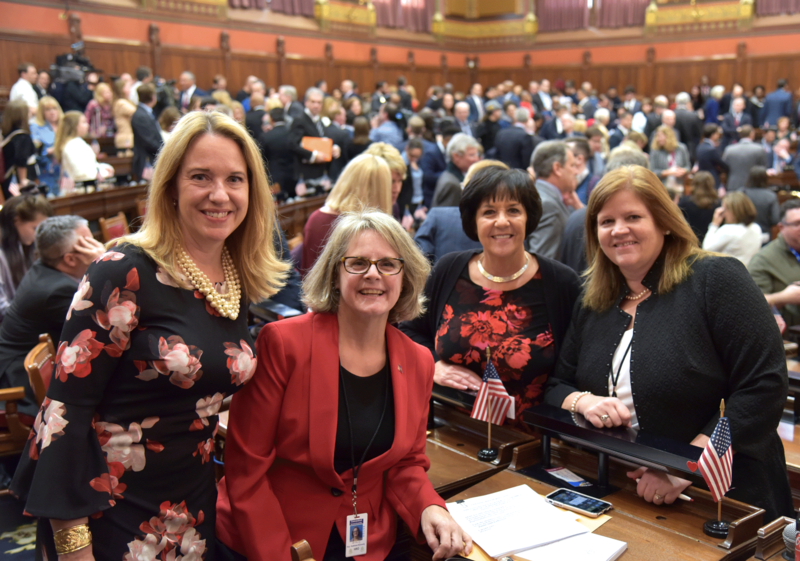 Photo (from left to right): State Representatives Leslee Hill (R-Canton), Kathy Kennedy (R- 119), Gale Mastrofrancesco (R-80), and Irene Haines (R-34) are the four newly elected women that will serve in the House Republican caucus during the 2019 – 2020 legislative term. HARTFORD – State Representative Leslee Hill (R-Canton) was sworn in today for her first term as state representative. Rep. Hill will serve the towns of Canton and Avon, which make up the 17th Assembly District. “I look forward to serving the residents of the 17th District. It is my goal in Hartford to address our state’s struggling economy and to stabilize the state budget so that our businesses and families have the confidence to grow and prosper in our local communities. I will be working with colleagues from both sides of the political aisle to craft common sense public policy,” stated Rep. Hill. The legislature will be in-session for a five-month period, adjourning on Wednesday, June 5.